It may seem like a small victory, but paper still exists. Yes, paper, that humble material. What we once claimed to drown in is now a collector’s item. For some, it’s like Tic Tacs, disposable and then who cares? But many do cherish and covet it. I’ve seen someone sniff paper and sing, “Ohh that smells like paper.” I’ve seen someone mourn a crinkle. I’ve seen strange rituals involving paper cuts (no, I jest). In spite of the digital and the recycling revolutions, paper survives. Better than that, paper, and the things placed atop it, are time capsules. If you enjoy libraries or archives you can appreciate that. So, it’s no wonder that people hoard newspapers. Their hoarding keeps long-dead information in constant vigil. Jeremy Lundquist isn’t a hoarder but he has collected ephemeral papers, or ephemera, in order to propagate them, to let them live again and again. His output, fittingly, is on paper. 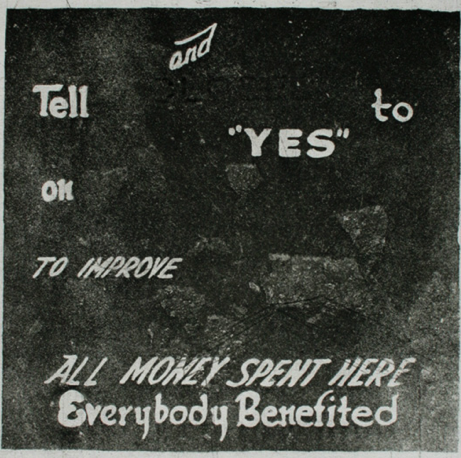 Lundquist is a printmaker, itself a technology on the brink of extinction and with a thick history, from mass commercial applications to avant-garde experimentation. Artistically, Lundquist sits right between these two poles, culling material from pamphlets and signs and turning them into subtle etchings that kiss the paper they’re printed on. Handwritten notes, tourist pamphlets, temporary signs and a map of Meigs Field pre-destruction are Lundquist’s fodder. The dust of memorabilia and the hand sweat of craft combine in his new print series. Titled “Notice—Closed,” it is a rumination on dead ends, ellipsis and the energy of absence. While the summer resident at Chicago’s Spudnik Press, Lundquist created twenty-one prints from a single plate. That’s like sculpting twenty-one faces from the same block of clay. The result isn’t confusing or muddy, but like a Cubist portrait bust it captures twenty-one dimensions of time. Since etching involves a semi-permanent acid bite, each print in the series contains the residue of earlier images. Lundquist tried to rub these lines flat, but most persist. Lundquist cites an interest in death. “Decay/Prairie City” is the title of a bleak etching from 2000, merging the morbid with the Midwestern. He’s traveled among Minnesota, Wisconsin, Iowa and Ohio to participate in residencies and teach printmaking at various schools, the current stop being Chicago. In “Notice—Closed,” Lundquist explores a history of Illinois from Lincoln to Carl Sandburg using found images and quotes. Most of the images are clipped of context, though, and float like omens. Lundquist created a ghost for his last series, in 2008. A ghost is a technical term for pressing one final print after the full run, but without re-inking. It results in a faint impression, a ghost print. Lundquist’s perspective isn’t so much gothic as it is wistful. Skulls don’t figure into his images. Rather, from the provisional quality of his collected materials, and the slight method of reproducing them, leaks a gray vapor trail of memory. It’s the crackle of a vinyl record, the charm of degradation.